This is a really nice thing to have with some fruit. I’m all for eating yoghurt on its own but if you want to butch it up a little, or make it into an extra treaty thing then you can easily make chocolate yoghurt. This serves two. Melt 50g of chocolate of your choice in the microwave or in a bowl over a pan of simmering water. White chocolate gives a lovely vanilla-y flavour but experiment with milk or plain. Obviously milk or plain will colour the yoghurt. Now, for the yoghurt, use anything from 150g – 250g. We always have live Greek-style yoghurt (is any yoghurt dead yoghurt?) but use any plain yoghurt that takes your fancy. 150g gives you a very tasty dessert indeed. Chocolate-y tasting with a nice, clean tang of yoghurt. The more yoghurt you add, the more you’ll have to eat but the less sweet it tastes. Experiment..
Once the chocolate is melted you add the yoghurt, add a tablespoon in first so you get a smooth mixture then add the rest; stir it so it’s all amalgamated and serve with some nice fruit. Awesome, fairly healthy, dessert. If you want to up your good fats, sprinkle some chopped nuts on top. This entry was posted in Children, Chocolate, Pudding, Yoghurt and tagged chocolate, healthy desserts, yoghurt on June 5, 2014 by Annalisa Barbieri. 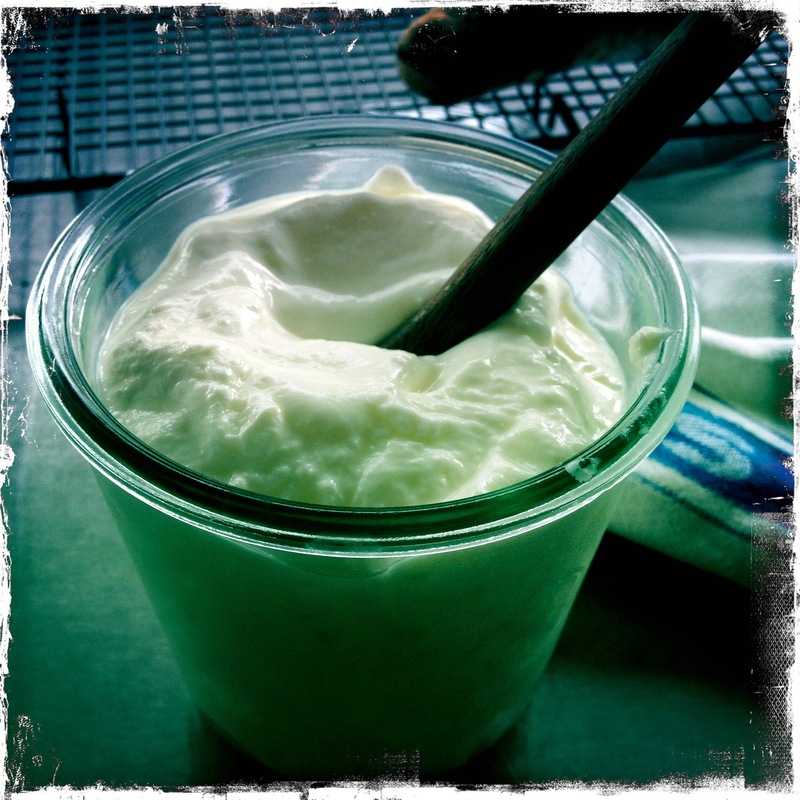 Ever since I started making my own yoghurt, I’ve looked out for recipes involving yoghurt. Prior to last year, I’d never used yoghurt in cakes. I’d used it, with much success, in pancakes, but cakes? No. Last year I found an amazing recipe for a very plain, but none the less delicious, lemon yoghurt cake. I’m not reproducing that one here because although the actual cake was delicious, the topping it recommended, was not. Using yoghurt in a cake makes the cake really moist and light, making it a bit more ‘shop bought’ in texture, which sounds mad, but sometimes I do like the texture (if not the taste) of supermarket cakes. This cake is a Donna Hay recipe. It’s light, easy, delicious, wonderful. And sometimes you need something easy, yet spirit lifting. Especially on a Monday. I hate Mondays. I find it so difficult to wrench myself from the bosom of my family and send my children out to school and me out to work. Cake makes it all better, and if it’s made of yoghurt and blueberries, that can’t be bad, can it? 150g unsalted butter, melted or very very soft. Oven to 160C. Put the butter, sugar, eggs, yoghurt, lemon zest and vanilla in a bowl and whisk to combine (I use a food mixer with a whisk attachment but it’s fine to use a wooden spoon/hand whisk and some muscle). Now add the flour and whisk until well combined Gently fold through the blueberries and spoon into a lined loaf tin of about 22cm x 8cm x 7cm. Smooth the top and bake for about an hour, bit more if it’s still very moist. A cake tester should come out clean. Cool and dust with icing sugar. Another favourite cake recipe that uses yoghurt in the icing is here and it’s delicious. This entry was posted in Cakes, Picnics, School fete, Yoghurt and tagged blueberries, cake, light, yoghurt on March 3, 2014 by Annalisa Barbieri. The reason I started making sourdough was because nowhere near where I live does proper sourdough. And even if it did, it would cost a fortune. As it is, making my own bread costs me about 50 pence per half a kilo of flour loaf. That would cost about £7 in a shop. There is no such imperative to making your own yoghurt. Sure, once upon a time, you could only get really not very nice yoghurt (thin and sour) but, now, supermarkets are full of them. Thick, creamy Greek yoghurt, drinking yoghurt, yoghurt with naughty corners, yoghurt stuffed full of fruit or delicately flavoured with vanilla or coconut. So there’s not a huge heap of point making your own – I may as well come clean. If you eat a lot of it, making your own does save money. I made some today which would have cost about £2 in the shop and cost me about a quarter of that. You know absolutely what goes into it. You can use it to make frozen yoghurts and cakes (more on these another time). I also use rather a lot of yoghurt in Ali’s Oatmeal Pancakes which we are totally obsessed with and top them with yet more yoghurt. You can also make just what you need. You make it using almost any type of milk. If you find you’ve run out of yoghurt, which I realise is hardly a crisis, as long as you have some starter and milk, you can make some overnight and have some for breakfast. If you get any whey off the top (sometimes you do and sometimes you don’t), you can use it to make sourdough (just use it to replace some or all of the water). You can use it to make your own drinking yoghurts and save a fortune (I’ll write about how to do this next week). So if you’ve decided to give it a go you should know that you can make yoghurt using no special equipment at all. Just a flask, or even a bowl wrapped in towels and placed in a warm place like an airing cupboard. But where would be the fun in that. Regular readers will know I love a gadget. The yogurt maker I have is an electric one by Lakeland. (£19.99 so it will take a while to recoup savings made on making your own, but isn’t that always the way when you buy a gadget. Note: I get 20% discount on Lakeland products.) I liked the idea of an electric one as the temperature is controlled. Yoghurt, like sourdough, needs a starter to get going. However, unlike sourdough, I find you can’t use a bit of your ‘old’ yoghurt to make a new batch. I find the cultures in the yoghurt weaken over time. I know some people have written about having a starter going since year dot. But this hasn’t been my experience. So what I do is buy some organic Greek style yoghurt (because that’s what I like) and freeze it in an ice cube tray and then take it out and defrost one cube per half a litre of milk (approx). I find that one small pot of bought yoghurt provides starter for about eight batches of my own. Probably more. I was never great at maths. You can make yoghurt using UHT milk, in which case it’s even simpler as you just use the UHT milk (at room temperature) and go straight to the bit where you put it into the yoghurt maker with the starter. Don’t dismiss this totally. I have a litre of organic UHT in the cupboard for yoghurt making emergences. I’m totally aware of how that sounds. So this is what you do. Get some milk, about 400ml. Don’t sweat it if you have a bit more or less. I use organic milk; either semi skimmed or whole milk. I have truthfully found no difference at all in the end product and so I use what we have. Whole milk is much better for you (less sugar) but we only get it twice a week so I usually have semi-skimmed and that’s what I use; the yoghurt in the picture was made with semi skimmed and it is so thick and creamy. If you want to guarantee really creamy yoghurt use two tablespoons of skimmed milk powder. You stir it into the milk before you boil it (or into the UHT milk before you add it to the starter, make sure it’s dissolved). I always use it. I do, of course, have a digital probe thermometer which I put in and it’s great as it also has an alert so tells you when it reaches a certain temperature (more on which this is useful in a moment). As soon as it reaches 100C (at which point it will froth up so you have to be on it), take it off the heat and leave it. Note: it takes longer to cool down milk for yoghurt than it takes to heat it up so be prepared. Now, yoghurt is made from milk due to two types of of bacteria: Lactobacillus bulgaricus and Streptococcus thermophilus. These multiply when the milk is at a particular temperature. If the milk is too hot it will kill the bacteria, if it’s too cold the bacteria can’t be bothered to work. This is why it is now crucial that you cool the milk to the right temperature. Some people are able to do this by dipping a clean finger into the milk, if it’s right you should be able to count up to ten with your finger in the milk. I have really cold hands so this is hard for me to get right so I use the digital thermometer to tell me when the milk has reached 44C. This is where the alert comes in. Why 44C? Well the temperature window you’re aiming for is no warmer than 49C (kills the bacteria above this) and no cooler than 33 (bacteria can’t get going). 44C works really well for me. When it reaches 44C you mix a bit of the milk with the starter and make sure it’s all well combined, then add the rest of the milk, mix gently but well and put in the yoghurt maker following the instructions for your own particular one. That’s it. It’s usually done after 6-8 hours. For a milder yoghurt leave for less time but sometimes it’s not set after six hours anyway so you have to go longer. When it’s done, put it straight in the fridge and then later decant into another container (if you want to) and use as you wish. I find it keeps easily for five days, we’ve never had to test it for longer. Your starter didn’t have enough bacteria in it. This is why it’s really a good idea to freeze fresh yoghurt and then defrost it just before you need it. There’s no reason you couldn’t freeze your own yoghurt I suppose, but I always freeze shop bought as I think that way you’re starting with a really fresh culture. Your milk was too warm or too cold. Temperature is key. You may get some whey on the top, either stir through or drain off and use it to water certain plants (blueberries love them, but dilute it, about 1/10 parts water and note I’m not a gardener, this is just what I’ve read). Or as I said above use it to replace water in bread baking. An ice cube size of starter – about 30ml, more if you want the yoghurt to set more quickly and if you want a milder taste (the less time it takes to set, the milder/cleaner the taste, more starter yoghurt means it sets more quickly, in less time). Two tablespoons of dried milk powder. Update: February 2014. Since I realised that a teaspoon of maple syrup was only about 15 calories, and the difference such a small amount could make to certain foods, I have been less reticent about using it. Some freshly made, but chilled, yoghurt, with a teaspoon of maple syrup and some soft, squidgy, cut up Medjool dates is really delicious and I’m not one to really say that of yoghurt based desserts. This entry was posted in Equipment, Yoghurt and tagged milk, yoghurt on August 9, 2013 by Annalisa Barbieri.